Louise de La Vallière, one of the early mistresses of Louis XIV, is an example of how an innocent young person of conscience can suffer unspeakably when getting sucked into a certain kind of lifestyle. Louise, born in 1644, came to Versailles as a maid of honor to Louis XIV's sister-in-law, the lovely "Minette" (Henrietta-Anne of England). Louise, virtuous and devout, fell in love with the king as he fell in love with her. She tried to resist his advances but eventually succumbed. She ran away to a convent in order to get away from him; he brought her back. She was a rare mistress, for she did not seek wealth and favors for herself or her family. She bore the king four children. The fleeting happiness Mademoiselle de La Vallière shared with Louis was nothing compared to the overwhelming humiliations and torment inflicted upon her by courtiers, by the queen, and by her own conscience. Louis gradually lost interest in her and became involved with Madame de Montespan. Because Madame de Montespan was married, Louis forced Louise to maintain the pretense of being his mistress. She had to be constantly in the company of La Montespan so that when the king came to visit his new mistress it would appear that he was visiting Louise. However, the entire court knew the truth and Louise had to bear the scorn heaped upon a fallen, discarded courtesan. She became ill and almost died, but when she recovered she went to confession and became reconciled with God. She publicly knelt before the queen and begged forgiveness. Then, she entered a Carmelite monastery as Sister Louise of Mercy. Louise spent the rest of her life in penance and prayer, praying especially for the king's conversion, which was realized when he married Madame de Maintenon, who was a friend of Louise. Both the queen and Madame de Maintenon came to visit her at the Carmel. Later Madame de Montspan visited as well, seeking spiritual guidance. Louise de La Vallière died in 1710. Author Sandra Gulland has a wonderful post on Louis XIV's other famous mistress, the seductive angel/devil, Athénaïs. Jeanne-Antoinette dressed up as a shepherdess for the ball and we can imagine how her heart thudded as she pushed her way around the crammed, candlelit Hall of Mirrors, looking at the masks worn by the enormous chattering crowd and wondering when her moment was to come. She had been told that the King and his closest friends had decided to attend in the rather novel disguise of a group of clipped Yew trees and so she must have peered closely at each topiaried bush as it danced past, wondering which one was the King until finally one came to a halt in front of her and removed his mask, revealing the monarch’s laughing dark eyes. I always think that stories of mistresses and adulterous affairs are very sad. 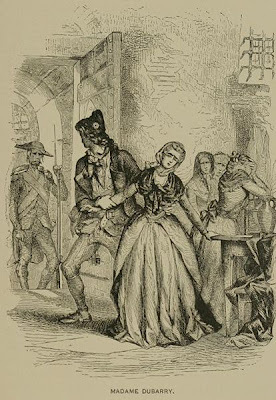 Jeanne Bécu, Comtesse du Barry, the notorious mistress of Louis XV, was guillotined on December 8, 1793. 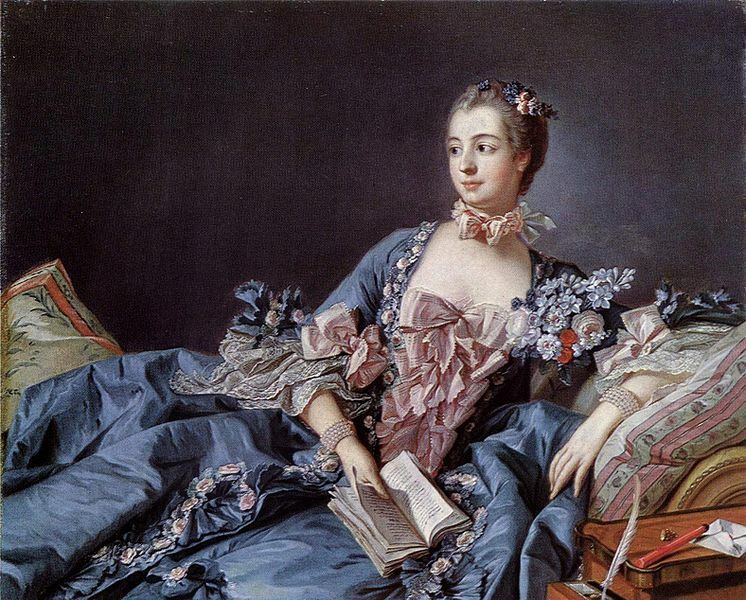 Madame du Barry was the successor of Madame de Pompadour in Louis XV's affections. At the court of Versailles she belonged to the party opposing the Choiseul-Pompadour clique which had arranged the marriage of the Dauphin Louis-Auguste to Marie-Antoinette of Lorraine-Austria. 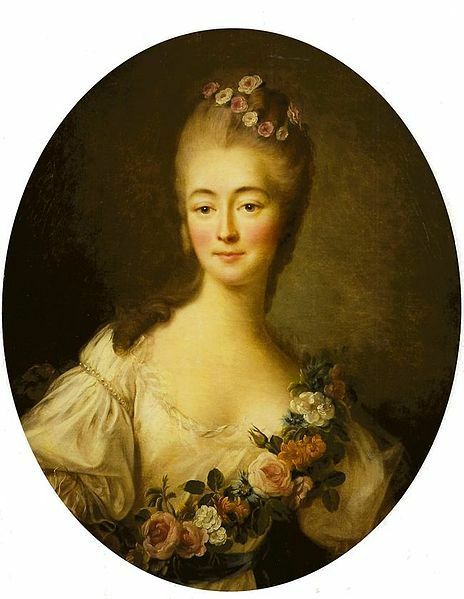 Madame du Barry was allied with the royal family, who were against the Austrian marriage. The daughters of Louis XV, although she was more or less on their side, would have disliked anyone who shared their father's bed, on moral grounds. It was they who encouraged the teenage Marie-Antoinette not to speak to Madame du Barry. The young princess shunned the courtesan, causing a diplomatic crisis. The aunts were not always prudent in the guidance of their nephew's bride, whom they ultimately damaged through their own pettiness and gossip. Much has been made of Marie-Antoinette's refusal to speak to the royal mistress, but it was the kind of power play that happened in courts all over Europe. I sometimes wonder that if Marie-Antoinette had lived to be an old lady and had died peacefully in her bed, if anyone in posterity would have given the incident between her and Madame du Barry a second thought. Because Marie-Antoinette died stripped of all human dignity, after being destroyed in practically every way a woman can be destroyed, with her reputation in shreds, people are always looking for reasons that led to such a dreadful fate. Hence the focus on the early rift with Du Barry, which but for the debacles that followed, would have been forgotten. It is said that Madame du Barry became hysterical on her way to execution, begging them not to hurt her. Her last words to the executioner: "Encore un moment, monsieur le bourreau, un petit moment." ("One moment more, executioner, one little moment.") Unfortunately for her, the moment had passed. Matterhorn wrote: I always think that stories of mistresses and adulterous affairs are very sad. I do, too. Such decadence and public scandal weakened the monarchy and then poor Louis XVI and Marie-Antoinette had to bear the brunt of it all. The Duc faced Madame de Genlis. "It is very important for a prince to have a virtuous wife. That is one thing which I hope you have instilled in my sons." "Someday, she will leave you." Madame de Genlis' usually musical voice came to him like an icy wave. "And someday, perhaps, so will I." "The mother of my children will never leave me," replied the Duc. "And neither will their governess." He may have been against despotism, but he could sound dictatorial when he chose. He started for the door, but suddenly spun around and flashed her his most charming smile, his features handsome and seemingly benign. "Now, Félicité. Now it begins." "Now it begins," she echoed him in hollow tones. "But where will it end?" And she gazed with unseeing eyes out of the window into the depths of the night. 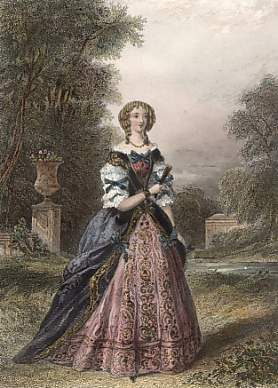 Madame de Genlis did indeed eventually leave her lover, the Duc d'Orléans, called Philippe Égalité. His wife left him as well, before he died on the guillotine in November 1793, where his vote had sent his cousin Louis XVI a few months earlier. 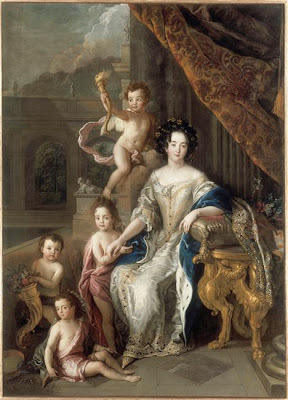 Madame de Genlis was originally an attendant of the Duchesse, then the Duc's mistress, and eventually the governess of the Orléans children. It was considered odd and even vaguely scandalous for a woman to have charge of the education of Princes of the Blood. However, Philippe d'Orléans truly appreciated her innovative educational ideas. 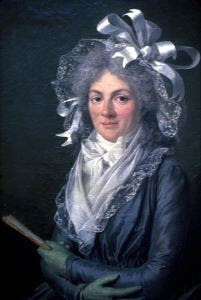 Madame de Genlis, an admirer of Rousseau, had the young princes chopping wood and fetching water so that they would learn a healthy respect for manual labor, a respect which many nobles did not possess. It was similar to the way Marie-Antoinette made her daughter Madame Royale wait upon peasant children at table. Madame de Genlis taught the children at a small house on the grounds of a monastery called La Bellechasse. There she had free rein in inculcating them with all the new ideas. She did not wear rouge or powder in public and so was seen as being loose and daring. One of Madame de Genlis' pupils would grow to become Louis-Philippe, the "Citizen-King." His liberalism came directly from his governess. However, Louis-Philippe in his memoirs later complained that Madame de Genlis lavished more attention on a young girl named Pamela than upon his own sister Adélaïde. Pamela is shown in the Giroust painting (below) turning the pages as Adélaïde is given a harp lesson by Madame de Genlis. Louis-Philippe insisted that Pamela was not the love child of Madame de Genlis and his father the Duc d'Orléans. The identity of La Belle Pamela continues to be mysterious, and the subject of a recent novel. It appears she was the daughter of Madame de Genlis by someone, although Madame claimed to have adopted her. At any rate, Pamela had an immensely interesting life, marrying the Irish rebel Lord Edward Fitzgerald. As for Madame de Genlis, she managed to escape death in the Revolution, which she been deeply in favor of in a Girondist sort of way. Writing being one of her many accomplishments, Madame de Genlis' children's stories became popular in England. She also wrote pious novels, especially during the Restoration, when everyone became more religious. Some thought it hypocritical of her to be so preachy. She died shortly after her former student Louis-Philippe took the throne from Charles X in 1830. 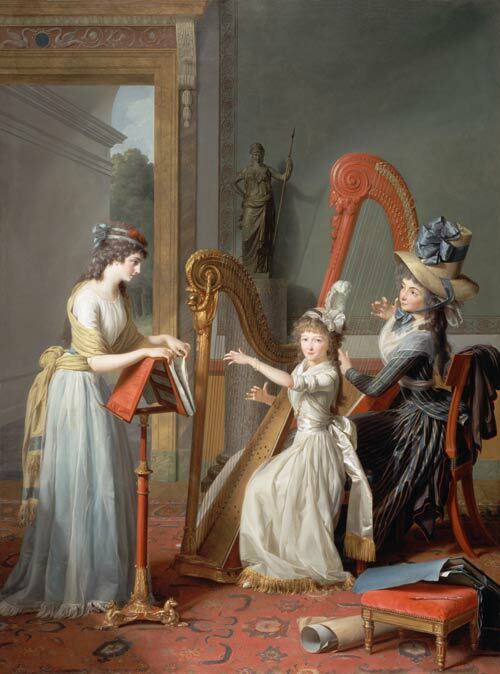 Madame de Genlis (in black dress) teaching Mademoiselle d'Orléans to play the harp. Pamela holds the music. 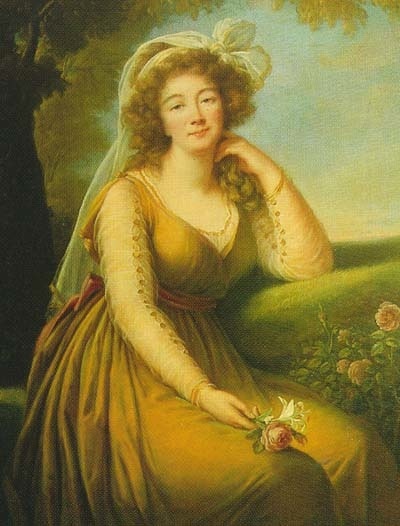 Now Madame de Balbi (nee Caumont de la Force) was a lady separated from her husband, and supposed to be higher in Monsieur's favour than she ought to be; and we wish we could only smile at the simplicity with which the Prince makes a public confession that, though he would not accept the ministration of a Constitutional priest, he consulted Madame de Balbi on the spiritual concerns of his conscience! I suppose we should be edified that Provence thought of such deep things as the possibility of martyrdom, in light of some of his other behaviors. His own account of events dwells a great deal on what he had to eat and drink in the inns at which he stayed during his escape. He was a Bourbon, after all; the Bourbons appreciated good food, Provence perhaps more than the others. As for Madame de Balbi, they parted during Louis XVIII's years of exile, when he had to endure poverty and humiliation, which he expected his wife and family (including the daughter of Louis XVI and Marie-Antoinette) to share with him but not his mistress. Besides, Madame de Balbi gave birth to twins who were not fathered by Louis XVIII. She returned to France during Napoleon's reign and lived in the provinces. She died in 1842, long after the Bourbons had been restored and exiled again. She was the last "mistress" of a King of France although probably a chaste one. Gradually, Madame du Cayla succeeded in establishing almost as complete an ascendency over the mind of Louis XVIII. as she had over his heart, and used it without scruple in the interests of the ultra-Royalist party. 'From the day,' writes Pasquier, 'when M. Decazes had been taken from him by proceedings which had wounded his heart, his self-esteem, and his regard for the royal dignity, the King had only occupied himself with business so that it should not be said that he had given it up.' 2 Weighed down beneath the burden of his infirmities, he had begun to fall into a state of apathy which put him at the mercy of those who resolutely applied themselves to the task of governing him. Occasionally, a flicker of the old spirit would reveal itself, but it was speedily quenched; all he desired now was peace and quiet, and Madame du Cayla would give him none until he had surrendered to her will. To her influence may be traced the fall of the high-minded and patriotic Duc de Richelieu, who had refused to lend himself to the plans of Monsieur [Artois] and his friends ;8 the nomination of Villele as Prime Minister; the ignominious dismissal of Chateaubriand from the Ministry of Foreign Affairs, and the acceptance by the King of the Septennial Bill of 1824 and other reactionary measures. The attitude of the different members of the Royal Family towards the favourite is interesting. Monsieur, although he does not appear to have been a party to the plot woven around his helpless brother, at any rate in its early stages, did not scruple to take advantage of it, and repeatedly urged Madame du Cayla to 'ignore the things which spite and folly might say against her, and to enjoy in peace the noble use which she was making of the confidence and affection of the King. '4 The Duchesse d'Angouleme, on the other hand, could not bring herself to countenance a lady to whom gossip had attributed in her youth at least one unorthodox connection, and not only treated her with coldness, but expressed her displeasure at the intimacy which existed between her dame d'atours, Madame de Choisy, and the favourite. At the same time, we may venture to doubt if, at heart, Madame altogether regretted an intrigue which, however unworthy it may have been, had put an end to the dissensions in the Royal Family and was doing so much to promote the interests of the party whom she honoured by her protection. 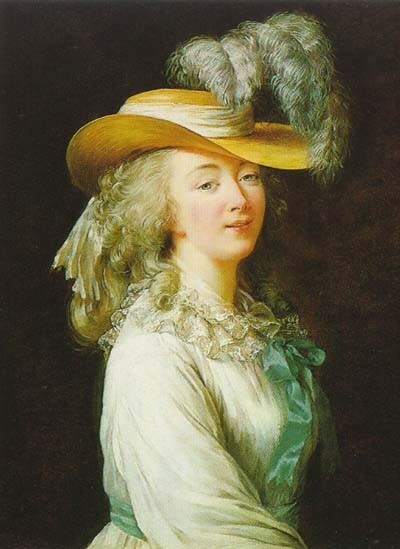 As for the Duchesse de Berry, less fastidious in her choice of friends than her sister-in-law, she appears to have been on very good terms with the favourite, though she did not at all approve of the King's habit of referring to Madame du Cayla, even in the presence of his family, as 'his third daughter,' which seemed to place that lady on a footing of equality with the Duchesse d'Angouleme and herself; and, on one occasion, she expressed her sentiments upon the matter rather pointedly. However, the relations between the two ladies were, on the whole, excellent; indeed, Madame du Cayla appears to have entertained a real affection for the princess, since she remained faithful to her cause after the Revolution of 1830, corresponded with her frequently, and even intrigued on her behalf. Nothing so perplexed and annoyed the Duchess d'AngouIeme and the Count d'Artois, in the last mouths of Louis the Eighteenth's life, as his obstinacy in refusing to receive the archbishop and to submit to the ceremonies which the Catholic Church imposes upon dying moments. He refused, as a condemned man would the visit of the executioner. At length Madame Du Cayla induced him to consent, and in so doing closed the door of the king's apartment against her for the rest of her days. Louis, grateful, made a will in her favor and left it on his desk. But Charles the Tenth entered his brother's cabinet, carried off all the papers, burnt the will, and made a beggarly compensation to Madame Du Cayla of a thousand a year for her life. Madame de Cayla ended her days at her little palace of Saint Ouen in 1852. While some saw her as a schemer, others saw her as the last vehicle of grace for the ruthless Louis XVIII. His great love was Madame de Polastron, the sister-in-law of Madame de Polignac, whose death led to his conversion, and he never had a mistress again. And also celebrated for all the wrong reasons. How many remember either Louis XIV or Louis's XV's wives? Exactly. What bothers me is how the mistresses are celebrated as "strong women" who beat the system and used their sexuality to gain power. The heroines to me are those queens and wives who had to bear the humiliation of their husbands' adultery while holding the family together and bearing many children and doing all their duties. Hear, hear! Let's raise a toast to Marie Leszczynska and her fellow long-suffering queens! In the meantime, our friend Gareth shares his own thoughts on the case of Madame du Cayla. Like Gabrielle de Polignac at the court of Louis XVI, Madame du Cayla eventually used her friendship with the royal family to promote a conservative political agenda - in this case, furthering the cause of the Ultras, the far-Right of nineteenth century French royalism. Louis XVIII had come to the throne in 1814 with the intention of attempting to arbitrate between the Left, liberalism and the Right, in the hope of healing the political scars caused by the Revolution. However, after the assassination of his nephew, the Duc de Berry, by a republican terrorist in 1820, the ageing monarch moved further to the Right. Liberal monarchists, dismayed at their sovereign's new-found sympathy for the Ultras, tended to blame Madame du Cayla, in much the same way as devotees of Louis XVI and Marie-Antoinette had castigated Gabrielle de Polignac as a canker at the heart of government in the 1780s. Given the closeness of the obese King Louis to the radiant and sophisticated du Cayla, many assumed (then and now) that she was his mistress.